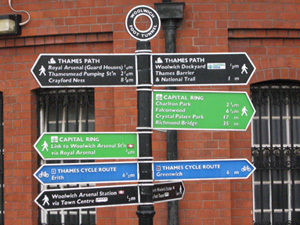 In East London, we don't need to go very far to find a long-distance walking route. We’re within easy reach of four of London’s strategic walking routes – the Thames Path, Capital Ring, Lea Valley Walk and Jubilee Greenway. We know from experience – having walked the full length of all four of these routes – that they make fascinating walking projects for a keen group. You can tackle them over several days, weeks or months, with daily distances pitched to suit each group. Further afield, we've organised a group walk of the 85-mile Ridgeway, from Avebury to Ivinghoe Beacon, over two long weekends. And we've followed the Thames Path over its 180 miles, from a mere dribble in a Gloucestershire field to the Thames Barrier. Walking a long-distance path offers some special rewards. As you progress, stage by stage, you follow the story of the trail and begin to make sense of the landscape around you. There's camaraderie too as you bond with your fellow walkers, enjoying a growing sense of achievement with each day's progress together. If this sounds like the kind of challenging project you'd like to set up for your group over the coming months, then get in touch and we can bounce around a few ideas together.